This is the process of making Dickens’ desk I made some time ago. Turning pages and here’s another one! 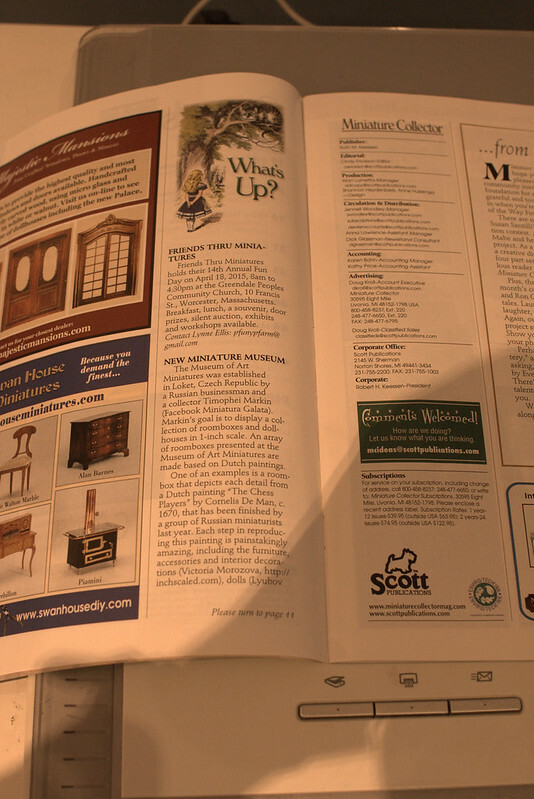 Small article about me and some photos of my furniture and art nouveau roombox. Still cannot believe my eyes, very happy and humbled. Thank you, Madelva and thank you all for reading my blog! 🙂 Good weekend to you, guys! To all who subscribed to my site updates through email – sorry for Friday spam. I’ve been translating and moving some old posts from my English blog to this one. I totally forgot that I needed to disable my “Follow” plugins. 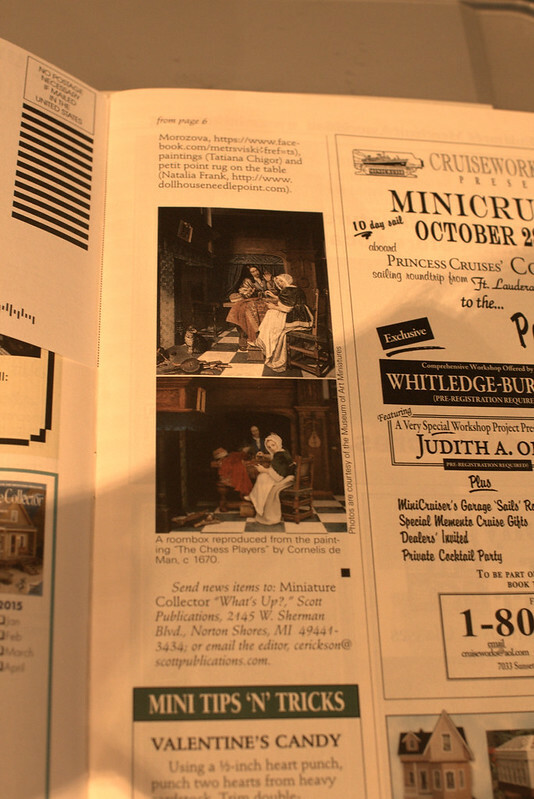 The good news this week – my first Miniaturas magazine arrived yesterday. I’m totally thrilled, I had couple of issues found on Picasa, some through my friends in Spain. I really wanted to subscribe to this wonderful mag, as it proved to be one of my favorite. The only problem was – my Spanish not that good, not good at all. Oh, and there was another problem – no digital subscription. That’s what was stopping me actually. But when one of my English mags subscriptions expired I immediately thought of Miniaturas. It was worth it in the end. The cost is about the same as some English mags, but the quality is beyond compare really. I love it to bits! 🙂 I expected to receive one issue, but I got two actually! What a great surprise! The quality of paper, photos is a-ma-zing. Period. Usually I skip through the pages quickly to discover only one or two articles worth reading, but this time I enjoyed every single page. Among other news, I’ve subscribed to another British magazine – The Dolls’ House Magazine. Very original title. I love that they have apps for Android and iPad together with pocketmags.com. So now I receive only two mags, both from UK. 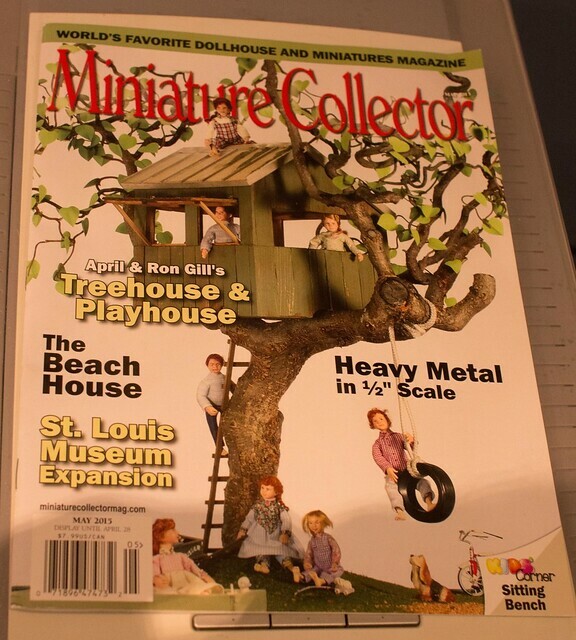 Last month I cancelled my subscription for American Miniaturist and Dollshouse World i-mags. I’ll never buy anything from Ashdown again, seriously. Couple months ago I found that I couldn’t access Dollshouse World i-mag, at first I could see no pictures, and then all I saw was 404 error. I thought at the time that they have some problems with a server or something. After a month of this 404 error I wrote to UK office support. Actually, I was the first Russian subscriber, they didn’t even have Russia in their list of available countries, I had to ask to add it back then (it was 2 years ago I think). Anyway, this time I got no reply. Also, suddenly the same thing happened with American Miniaturist i-mag page, again this 404 error, then dollshouse.tv and all ashdown sites. I’ve checked from different IPs, different ISPs, and found that I couldn’t access these sites only from Russian IPs, if I was using American proxy everything was just fine. I wrote the second mail to UK office, no reply again. I thought, this is ridiculous, I pay for the service they can’t supply, I don’t even get the answer from Tech Support. This time I tried US office, I received the reply saying that it was their new security policy, they closed many IPs to prevent hacker attacks (yeah, like I’m a hacker, right). They said they forwarded my mail to UK office, can you guess if I got the reply?And nothing about refund, nada. I had to ask for it myself, and yeah, I didn’t hack anything, I prefer to pay for the service. Eventually they send my refund to my Paypal account, it wasn’t full, I got it for the remaining months. I was lucky here, because just several weeks ago Russian Paypal couldn’t accept money, only send them. The best part of the story – I still receive spam from them asking me to renew my subscription. They just don’t remove my email from their list.